Conventional wisdom says that selling additional products and services to existing customers should be simple and less expensive than acquiring new ones. Yet if you are a sales or marketing leader chartered with growing revenue by selling spare parts, consumables and services to your installed base, you know that oftentimes, nothing can be further from the truth. Unlike when dealing with the initial sale of the equipment, the tools available to you and your team – CRM, Marketing Automation or ERP – can’t really help identify which customers to call, when, for what products, and the reason. Instead, you try to make sense of multiple spreadsheets, cumbersome and conflicting reports, legacy systems, and limited visibility into service and support systems. Does this sound familiar? There’s nothing efficient about dealing with multiple reports, spreadsheets, and bouncing from one system to another to try and retrieve the most accurate and up to date customer information (what equipment they have, order history, call center data, service contracts, etc.). Digital transformation can help drive efficiency in the form of data availability at the user’s fingertips. Calling customers with a complete view of their account information, transaction history, etc., saves precious man hours and ultimately provides a better customer experience. Palo Alto-based startup Entytle is taking this approach. Applying data science and machine learning algorithms to massive amounts of customer data, their software is able to cleanse and reconcile customer information to provide enhanced installed base visibility. Only then, leveraging accurate and complete data, the system proactively pre-populates warm leads and quantifiable business opportunities for aftermarket sales and services. 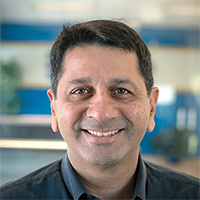 Vivek Joshi is the CEO and Founder of Entytle, a Palo Alto based company that helps industrial manufacturers increase customer loyalty and lifetime value. Entytle’s Aftermarket Engagement platform Insyghts assembles data from multiple systems, and processes that data to identify usage patterns and customer segments, deliver service & sales opportunities, and drive revenue from the installed base.